How many times have we heard statements like: "This is going to be the Latino Coachella!?" First, it was for Supersonico, which was totally cool while it was around but the scale of the event didn't nearly warrant the comparison at all. Then The Fresno Bee was trying to get crazy and directly call their Pueblo Fest event such thing, but the lineup didn't quite reflect Coachella's tendency to dip all over the place. And then comes Tropicália with Los Tigres Del Norte and East LA's own "cumbia-punk" band, Thee Commons. Cuco with a side of tacos dorados de camarón from Mariscos Jalisco sounds like a great fucken time to me. It seems like they've got the music-event-meets-food-event component down at least, focusing only on the heavy hitters like Carnitas El Momo, Burritos La Palma, and Pez Cantina. "To be part of the fabric of this event is going to be great," says Brett Thompson of Pez Cantina. He will be serving taquitos dorados de carnitas or papa and a chicken pozole verde. The latter should really hit the spot as the cold ocean breeze kicks in and you are drinking up a storm. All tacos of which are going to be *free* if you can make it before 4 PM. I'm not sure if a Latino Coachella is what The Observatory was going for with this lineup, but I'm pretty sure I'm not the only one who is thinking this. However, if we really want to get critical: In California, Latinos are no longer a niche. We don't need other music and food events as comparisons. After all, we are the new general market. 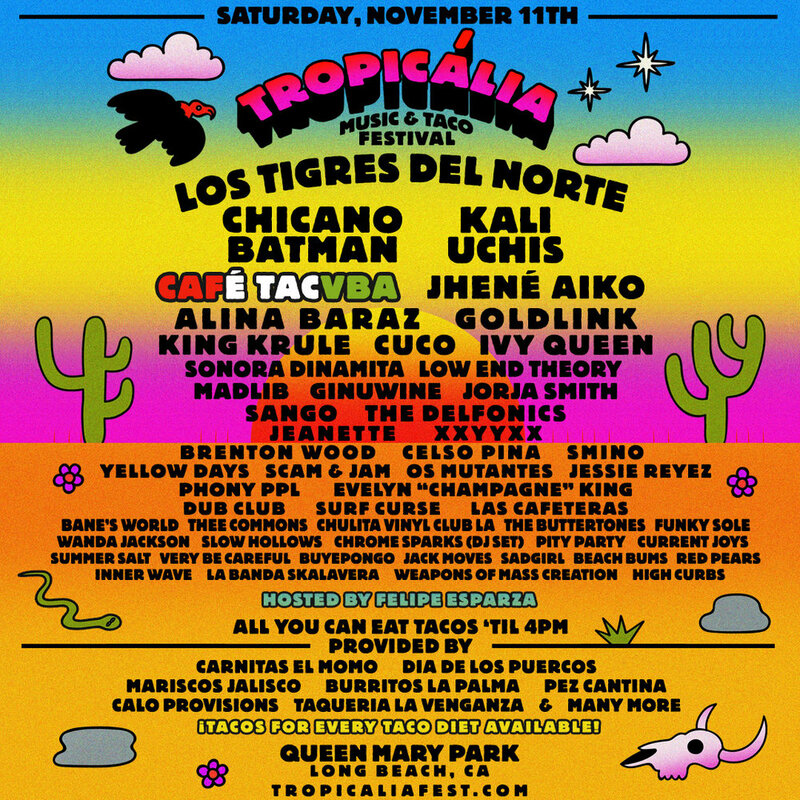 Tropicália Music & Taco Festival is taking place on Saturday, November 11th, 2017 at Queen Mary Park in Long Beach, California. For tickets and more information, visit their website.